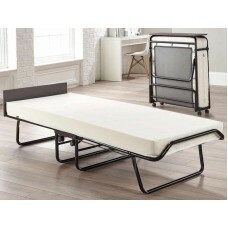 The Guest Bed frame is perfect for accommodating overnight guests. It folds down easily for storage ..
British made with a lifetime frame guaranteePatent pending folding mechanism for space savingSuitabl..
British made with a lifetime frame guaranteeSuitable for regular useJ-Tex™ sprung base system for su.. The Solo Slimline full length guest bed houses a same size 2ft 6in x 6ft 3in (75cm x 190cm) under be.. The Buckingham Slimline 1000 full length guest bed houses a same size 2ft 6in x 6ft 3in (75cm x 190c..